LOS ANGELES--(BUSINESS WIRE)--Funny Or Die and IMDb (www.imdb.com), the world’s most popular and authoritative source for movie, TV and celebrity content, are taking celebrities on a “scroll down memory lane” of their IMDb pages in a new digital series, IMDb Me, that launched today on IMDb.com, IMDb’s mobile apps, and on Funny Or Die. The first episode features Academy Award nominee Willem Dafoe (The Florida Project, Shadow of the Vampire, Platoon) who begins talking about his very first IMDb credit, Heaven’s Gate, and the story behind his firing. 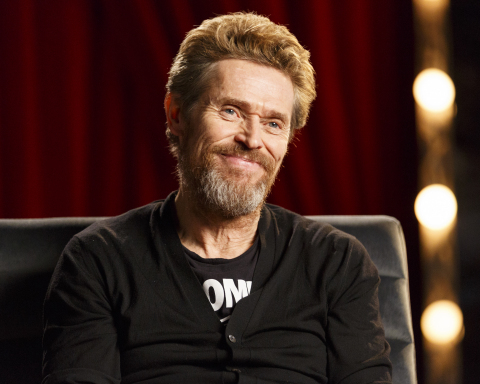 Dafoe covers many of his acting credits, spanning four decades and over a hundred films, with great commentary and behind-the-scenes trivia including a story about the improvised birds scene from his most recent film, The Florida Project. All episodes will be directed by Jake Szymanski (Tour De Pharmacy), whose voice is heard off-camera asking talent questions about their roles and challenging actors to remember specific details from movies they have long forgotten. Additional episodes are slated to premiere beginning next month. Beginning today, viewers can catch the premiere episode of IMDb Me on www.funnyordie.com, as well as at www.imdb.com/imdbme and on IMDb’s iOS and Android apps. Fans will also receive regular updates about the series on IMDb’s and Funny Or Die’s social media channels, including YouTube, Facebook, Twitter and Instagram. “As everyone in the entire world knows, Hollywood talent celebrate and obsess over their IMDb pages,” said Mike Farah, CEO of Funny Or Die. “So I’m not certain a more important series has ever existed. I’m so excited for Jake to dig deep with such amazing actors about the highs and lows every career in entertainment faces,” he added. Funny Or Die is a premiere entertainment brand and production studio that creates award-winning comedy. Known for its celebrity driven and political content, Funny Or Die reaches a global audience of more than 60 million people, and is the #1 comedy brand on both Facebook and Twitter. Funny Or Die’s Emmy Award-winning long-form division currently produces shows like the critically-acclaimed Brockmire for IFC, the Emmy-nominated Billy on the Street and The Chris Gethard Show for truTV, American Vandal for Netflix, the Sarah Silverman series I Love You, America for Hulu, and No Activity for CBS All Access. FOD also makes award-winning TV commercials and Branded Content for brands such as Pepsi, McDonald’s and Chrysler. Funny Or Die’s founders are Will Ferrell, Adam McKay, and Chris Henchy. Judd Apatow is also a principal partner. IMDb is the world’s most popular and authoritative source for movie, TV and celebrity content. The IMDb consumer site (www.imdb.com) is the #1 movie website in the world with a combined web and mobile audience of more than 250 million unique monthly visitors. IMDb offers a searchable database of more than 250 million data items including more than 4 million movies, TV and entertainment programs and more than 8 million cast and crew members. Consumers rely on the information IMDb provides – including local movie showtimes, ticketing, trailers, critic and user reviews, personalized recommendations, photo galleries, entertainment news, quotes, trivia, box-office data, editorial feature sections and a universal Watchlist – when deciding what to watch and where to watch it. IMDb’s portfolio of leading entertainment apps (http://www.imdb.com/apps/) includes its popular “Movies & TV” app for iPhone, iPad, Kindle Fire, Android phones, Android tablets and its mobile-optimized website. To date, there have been more than 150 million downloads of IMDb’s mobile apps worldwide. IMDb’s X-Ray for Movies & TV Shows (www.imdb.com/x-ray) is a feature that revolutionizes the viewing experience by bringing the power of IMDb directly to Kindle Fire HD, Fire TV and Fire TV Stick. IMDb’s Facebook page (https://www.facebook.com/imdb) and official Twitter account (https://twitter.com/imdb) are followed by more than 12 million passionate entertainment fans. IMDbPro (http://www.imdbpro.com) is the essential resource for entertainment industry professionals. This membership-based service includes comprehensive information and tools that are designed to help entertainment industry professionals achieve success throughout all stages of their career. IMDbPro offers members the following: detailed contact and representation information; IMDb profile management tools; exclusive STARmeter rankings that are determined by page views on IMDb; a casting service to post breakdowns and apply to roles; a mobile optimized website and more. Additionally, IMDb owns and operates Withoutabox (http://www.withoutabox.com), the premier submission service for film festivals and filmmakers, and Box Office Mojo (http://www.boxofficemojo.com), the leading online source of box-office data. IMDb.com is operated by IMDb.com, Inc., a wholly owned subsidiary of Amazon.com, Inc. (NASDAQ:AMZN) (http://www.amazon.com). To learn more, go to: http://www.imdb.com/press.